Looking outside through my family room window I can still see the yard full of Christmas decorations and lights in one of the houses in our development. We barely did any decorations outside this time. Our outside decoration was limited to a Christmas wreath on the door. Boxes full of icicle lights are still sitting in the basement untouched. There are so many things going on around this time that we are hardly finding time to do all these decorations this year. Kids were excited to put the Christmas tree up, so it happened a week ago. Yes I know it was late too!!! Anyway, I didn't want to miss the baking spree I always enjoy during this time of the year. Honestly speaking last few days, I was busy baking batches of cookies for the Christmas Carolers. Our Church has a tradition of going to houses with most of the church members including kids and sing carols. It's a fun filled whole day process. 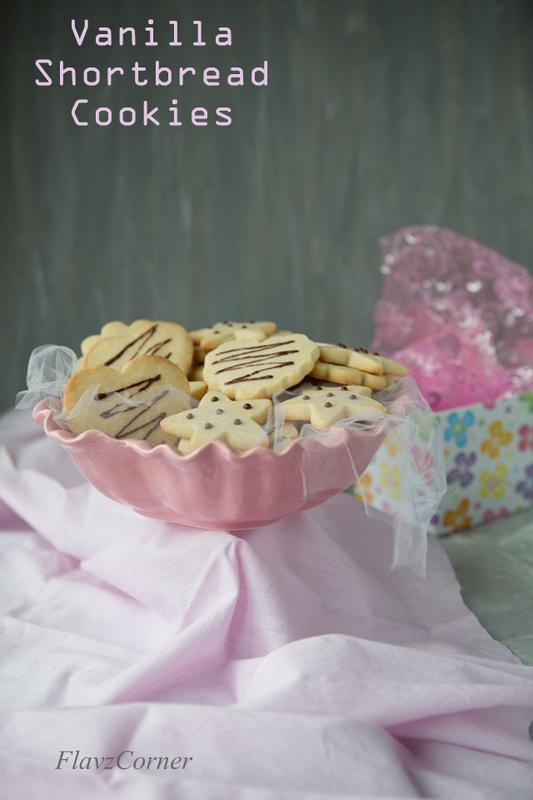 Here is a recipe for eggless Shortbread Cookies that you can make with your kids or even by yourself. My kids were excited to cut out different shapes with the cookie cutter. They look so cute and you can decorate as you wish. I simply used some melted chocolate to do the final touch of decorations rather than sugar coated icing. You can use Vanilla or Coconut or Almond flavoring for these cookies. I prefer pure Vanilla extract flavor for these cookies. This is one of those simple recipes that use the ingredients you can find in your pantry all the time. If you don't have a cookie cutter, you can even use a serrated knife to cut out the cookies in rectangles, squares or in triangles. You can even use a floured Mason jar lid to make some round cookies. Beat the butter to achieve a smooth and creamy texture in a mixing bowl of a stand mixer using paddle attachment or using a electric hand mixer or a rubber spatula. Add the powdered sugar, salt and vanilla. Beat well on low speed for 30 seconds. Now add the flour and mix well till the dough is all crumbly and wet and holds together. Transfer the dough to the center of a plastic wrap sheet. Cover the dough with another long piece of plastic wrap. Now use your hands to smooth up the dough little bit to form a ball with the plastic wrap on. Using a rolling pin roll the dough to 1/4 inch thick circle with the plastic wrap on. Transfer the rolled dough to a flat plate and make sure all the edges are covered with the plastic wrap. Keep the plate with the plastic wrapped dough into the freezer to set for 5 - 6 minutes. If the dough is very sticky keep it for 10 minutes. Now the dough is ready to be cut out into shapes. Using your favorite cookie cutter cut out some shapes. Try to cut out maximum number of cookies from the first batch. Bake the cookies on a parchment paper lined baking sheet for 8 - 10 minutes or till the sides of the cookies starts to get very light golden brown. You have to make sure that the cookies are not over baked. Cookies should have white color. Repeat the rolling, freezing, cutting out process till all the dough is used up. Let the cookies cool completely on a wire rack. Using a double boiler method melt the 1/2 cup of chocolate pieces or microwave 4 cups of water in a microwave safe bowl for 4 minutes. Place the chocolate pieces in a smaller heat proof bowl and place over the bowl with hot water. Use a spoon to stir the chocolate, it will melt completely. I used 2 measuring cups of different sizes to do this. You can either dip a part of the cookie into the melted chocolate to decorate it and place on a baking sheet with parchment paper to cool. Or you can use a piping bag with writing tip to make some designs. Let the chocolate designs harden completely before transferring to an air tight container. 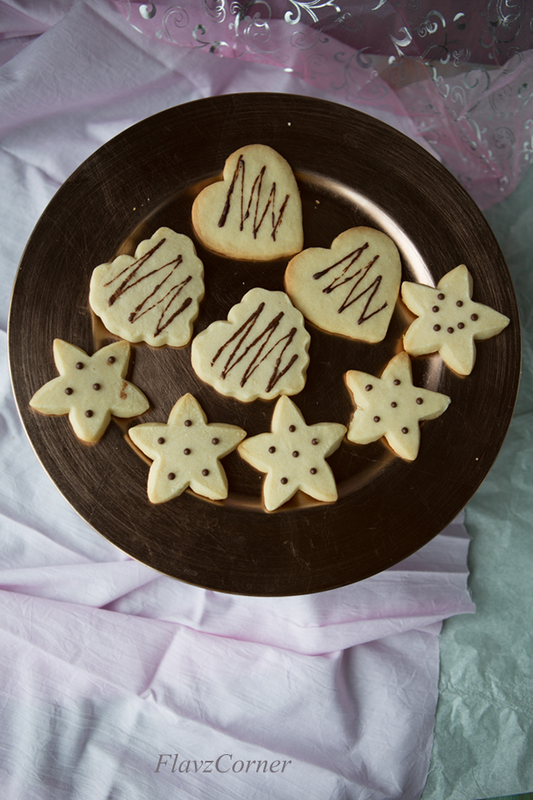 Love the buttery taste of shortbread cookies, I am sure ur kids would have loved it. Caroling must be so much fun.Have a nice time. Cute cookies. Christmas is so much fun especially if you are participating in carols! Have fun! 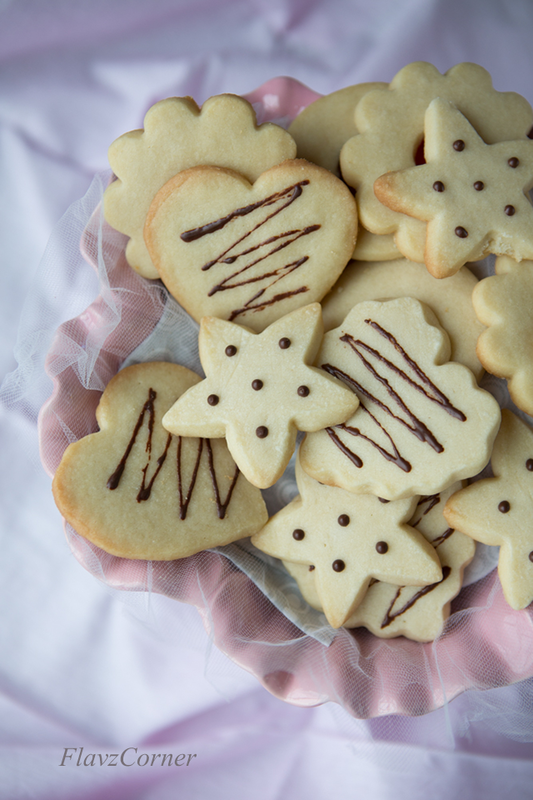 Love shortbread cookies and that cute decoration. In fact, i have been planning to bake some for the season. I donno whether I will get time. I love shortbread in any form! And I think cookies might be the best. These look wonderful -- perfect for the season. Thanks, and I hope your holidays are wonderful! Love buttery shortbread! These look simply delicious and beautiful with simple decoration. ... and I want to wish you & your family a blessed & healthy New Year filled with happy moments.